Introducing the Raypak Professional series pool heaters, designed specifically for commercial properties such as apartments, condos, hotels, motels, schools, parks, community and high-end private pools. It’s also the perfect heater for tough coastal weather conditions where salt air challenges durability. • Control is more precise than mechanical systems. It controls temperatures for pool and spa settings and stores diagnostic information for service technicians. • Is used liberally through-out the Professional series pool heater. Raypak spared no expense to ensure that any area that could be compromised by harsh environments would stand the test of time. • With brass headers and cupronickel tubes for maximum protection against the toughest pool applications. Excellent for salt chlorine generated pools. ASME certified & National Board Registered. • Constructed entirely of stainless steel. Every detail has been looked at, down to every nut and bolt, and made of stainless steel. This burner tray is built to last. • Has been a Raypak tradition for over 45 years. 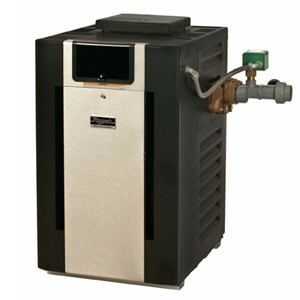 We utilize our unitherm governor system along with a spring loaded bypass to maintain the perfect flow through the heat exchanger. • Is the most reliable and safe ignition system in use today. For over 30 years Raypak has enjoyed reliable performance with a gas pilot system. Some things just don’t get any better. • Is at the heart of the Raypak Professional series heater. The competition doesn’t stand a chance against its fat .065 tubing walls. Raypak also uses integral fin tube, meaning it’s all one piece of material. • Is standard construction on all exposed wiring. This helps prevent rodent damage and other associated issues that can damage the wiring. Not to mention it looks very clean and tight. • Was the main goal in designing the Professional heater. Every aspect was evaluated and changed to stainless steel when any question of corrosion was a concern. • Are standard equipment on the Raypak Professional. This makes the unit 50 state ASME compliant right out of the box. Also, having a flow switch eliminates pressure issues from elevated pools. • Design is Raypak’s specialty. The Professional series heater can withstand fluctuating and varying gas pressures. The burner is self-adjusting and always yields a perfect flame.